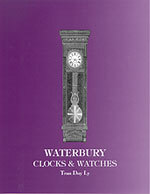 Waterbury Clocks & Watches - 2nd Edition, Volume 1, published in 2001. ISBN:0-930163-90-7 from pages 1-584, with 2,282 quality catalog illustrations and photographs. Tran Duy Ly began his epic project of publishing invaluable books and guides, probably no day has gone by when I have not consulted one of those volumes (I have them all) and no American-clock repair customer leaves my shop without having seen an image of their clock from one of his books. With the arrival of the Waterbury Clocks & Watches - 2nd Edition, Volume 2 there is almost a 100% chance that any Waterbury clock on my bench can be identified. Because I help catalog the R.O.Schmitt auctions, I rely on the Ly books for making sure each clock is correctly described. The first clock (a cigar cutter) on the first page of the new book was one I needed to research back in 2012 before the new book was printed; next time this and hundreds of other rare Waterbury examples will be at my fingertips..."
It was so good to talk to you yesterday. It’s hard to believe you are 82 and still have the stamina, determination and dedication required for the completion of your new Waterbury book. I pray for your continued good health. You are a treasure to American horology and those of us who study it. I am excited to be on your list to receive the new Waterbury book when it is published. Waterbury clocks are an American icon and each is a testament to the creativity and excellent craftsmanship of American clockmakers. I have owned and repaired Waterbury clocks and can attest to the quality that went into the building of each. Again, I want to thank you for your labor of love that has resulted in the finest collection of literature in the field of horology in the past century being produced. Your works are like a goldmine to collectors, to those who repair and restore these historic clocks and timepieces as well as the general public who might share an interest in our field. Please give Vicky my regards..."
beautifully illustrated and annotated horological references ever put to print. In the world of clocks for me Tran has been a personal friend for over 30 years but the real benefit of our relationship is that which he shares with everyone, his unbridled passion for undertaking the massive projects of each and every one of his amazing volumes! Just when one thinks what more could he possibly craft and deliver to the world he produces yet another incredibly informative, beautifully executed, and very important resource as in the form of his latest effort, 'WATERBURY CLOCKS & WATCHES - 2nd Edition - Volume 2.' This book is the perfect compliment to his revised 'WATERBURY CLOCKS & WATCHES - 2nd Edition - Volume 1', which was published in 2001. In this latest volume, totally unexpected and important identification information of so many more Waterbury clocks & watches makes possible for most every Waterbury time piece and clock to be correctly and accurately idenfified, chronicled and appraised. It is because of Tran's passion to furnish society with accurate information that we benefited forever with his incredible publications. It is an honor to have been part of Tran Duy Ly's research team for most of his books as this shared passion will live on for generations due to his vision and equally an honor to be part of his latest publication "WATERBURY CLOCKS & WATCHES 2nd Edition - Volume 2..."
"Dear Mr. Ly, I had purchased the new edition of the E. N. Welch book at the NAWCC National Convention, and then when I returned I also ordered both volumes of the Seth Thomas books, and the Ansonia book as a result of the flyer I picked up at the convention. My books arrived only four days after I had phoned in my order, and I have never received books that were packed so carefully. Your wife took my order over the phone and she was very pleasant and helpful. I have only had time to read the two volumes of the Seth Thomas books and I am quite pleased with my purchase so far. I would certainly recommend these books to anyone seriously interested in Seth Thomas clocks, and please let me know as soon as the Waterbury Clocks & Watches - 2nd Edition, Volume 2, is available. Thank you (and your wife) so much!" "...I got my book American Clocks Volume 2 and it is just great like all of Trans books. Please let me know as soon as the Waterbury Clocks & Watches - 2nd Edition, Volume 2, is available..."
"...As someone fairly new to the world of horology, your clock books especially the draft of the Waterbury Clocks & Watches - 2nd Edition, has been incredibly useful to me. While helping to catalog a large collection, the draft book was always close at hand so that I could identify Waterbury clocks quickly and accurately. In my clock repair work, customers enjoy seeing their family clocks as they were once advertised. Learning the original age, price, model name, and other details of their clocks brings them closer to these treasured heirlooms. In the end, they appreciate the clock, its history, its value, and my services all the more because of your books. Thank you for the excellent works you do..."
"...Hello Vicky & Tran, I hope that all is well with you. It's a new month now and time for me to buy some more of your wonderful clock books. Please send me the Seth Thomas Volume 1 & 2 third editions. It's time to replace my 'dog-eared' first edition which I bought back in 1985. It's literally falling apart! I must say that I am extremely happy to have the new Welch Clocks - 2nd Edition. I used it to positively identify my Welch 'Unknown Regulator No. 47.' Seldom does a day pass that I don't use at least one of a dozen or so of your excellent clock books for reference. They have helped me many, many times. Please put in my order of the Waterbury Clocks & Watches - 2nd Edition, Volume 2 book. I need it very bad. Many thanks..."
"...I really enjoyed speaking with you today. You are an amazing scholar and I appreciate all of the work you have done to make horology accessible through the books you have written. As I continue to learn more about clocks and their history, and enhance my repair/restoration skills, your books are at my side. The Seth Thomas Second Edition has proved invaluable. It is very complete and the movements section has already helped me avoid a 'marriage' clock. I plan to order the Waterbury Clocks & Watches - 2nd Edition, Volume 2, so please send it to me as soon as it is available. As with your other books, I look forward to using it as a reference that will further enhance my knowledge of these clocks, which will in turn make collecting much more rewarding..."
"...The Waterbury Clocks & Watches - 2nd Edition, Volume 2, is another great book comming from the best book publisher ever. I though you were going to retire. Your not retiring is a big win for all of us who have enjoyed your books for years...."
"...I am the proud owner of all of your books. Please send me the Waterbury Clocks & Watches - 2nd Edition, Volume 2, as soon as possible..."
"...Thank you for giving me the opportunity to review your Waterbury Clocks & Watches - 2nd Edition, Volume 2 at the Dayton National. Even though, I throughly enjoyed Waterbury Clocks & Watches - 2nd Edition, Volume 1, I was surprised at all of the Waterbury clocks that you have located since it was published in 2001. I know that you have said that Welch Clocks - Second Edition, published in 2013 was to be your last book, but I as well as the clock world should be enthusiastic about this book. Thank you for continuing to publish these very important clock publications that include additional illustrations and price guides..."
"...Tran Duy Ly’s books are an essential part of my horological library and are an important tool for my repair and restoration activities. They allow me to accurately date clocks and help me with case restoration. The detail and clarity of the pictures are more than adequate for my work. They also provide information that I am able to pass on to my clients and assist me in answering information requests that come through the museums that I am involved with. The concise history and tips in each edition only enhance the value of his books. I recommend that every collector and restorer make Tran Duy Ly’s books part of their library..."
"...I’ve been repairing and restoring antique clocks for over 50 years. Early on I recall several authors wrote 'price guides for antique clocks, some with poor photos and 'pasted up' catalogue pieces. Even though there were inaccuracies and huge price differences, these seemed to have a definite effect on the marketplace. Clock dealers always had a price guide by their side at the mart table, in shops, and even individuals looking for top dollar. 'It’s in the book for............' was the resounding cry. Some of the most fun that I’ve had with Tran’s books is with my customers. Many customers know little about a restoration candidate but are certain it’s been in the family or bought at an auction 50 years ago, and so forth. Often times I’ll get the customer to start thumbing through pages of the right category and walk away. Pretty soon, 'There it is!' they exclaim with great excitement. The year of manufacture, description and the original image which always prompts the question, 'So what’s it worth today?.' The book supplies that answer too. I can’t say enough kind words about your books, Tran. I have a few Waterbury clocks in my collection. I am partial to 1880’s - 1890’s walnuts and oaks. Your Waterbury books have been especially helpful with 'the hunt.'..." "...Your Waterbury Clocks & Watches 2nd Edition, Volume 2 is great. You have done so much for clock collectors with your books. You should be proud of the legacy you will leave for horology..."
- Volume 2 from pages 585-1,032, will be published in 2013, with 1,352 quality illustrations and photographs. Smyth sewn hardbound on white gloss enamel text with 2014 Price Update $69.50. Another Milestone. Volume 2, 2nd Edition of Waterbury Clocks & Watches by Tran Duy Ly will soon be published. Once again, extensive research by Tran and his staff, provides a compendium of useful information to all collectors, both novice and advanced, of the Waterbury Clock Company clocks and watches. Perseverance. The 1st Volume on Waterbury clocks was published by Tran 24 years ago. This was followed by revised and expanded book in 2001 and was thought to be all inclusive at that time. Most would have been content to stop there, however, over 300 pages of new information are provided in Volume 2, 2nd Edition. Content. Many additions have been made to each of the categories listed in Volume 1, and several new categories are now included in Volume 2. For example, an entirely new section has been included in the Mantle Clocks Category titled "Polished and Enameled Wood". Many of these models have gilt engraving, and gilt or bronze, ornaments as well as polished marbleized wood in gray, green or brown colors. If you collect Waterbury porcelain clocks this book is essential. From only four pages in Volume 1, an entirely new section in Volume 2, 2nd Edition, covering 37 pages, is included illustrating multiple examples of Waterbury's line of porcelain clocks. Rare models such as the Register with Fahrenheit thermometer marked for blood heat and temperature on a brass scale, barbershop gallery with reversed numerals, Keating, Kelsey calendar, Hall Clocks No. 62, 63, 64 and Corbetts Watchman's clock are illustrated. A variety of Waterbury clock dials, top ornaments, side figures and candlesticks are also shown. A new section on Jennings Brothers Clocks which used Waterbury movements, has been included. Finally, a section on Unknown American Manufactured Jewelers Regulators, both standing and wall models, has been added. Although not produced by Waterbury, many of these examples should be of interest to collectors. Many rare examples with descriptions are depicted. The Standard Bearer. Once again Tran Duy Ly has provided the clock collecting fraternity an opportunity to more fully knowledgeable and appreciate another important early American Clock Manufacturer. No one has contributed more to the field of Horology publishing than Tran. The publication of Volume 2, 2nd edition of Waterbury Clocks and Watches can now be added to the long list of successful publications on clocks by Tran Duy Ly. This is an outstanding book that encompasses a vast wealth of additional information on the Waterbury Clock Company as well as the added bonus of 30 pages of unknown regulators. When combined with Volume 1, they will serve as the foremost reference source for this American manufacturer and should become an essential addition to every clock collectors' library. The Arlington Book Company and Tran Duy Ly have not been resting on their laurels, but rather have been at work updating and improving previous publications. First to arrive was the much improved and expanded SETH THOMAS book. Soon on its heels came the ANSONIA book with its encyclopedic range. It has been 11 years since the original WATERBURY book was published. Many received it as a gift by the hosts of the Denver National Association of Watch & Clock Collectors Convention. Since my original copy is well dog-eared, a new volume is welcome. Included in the new 2001 edition of WATERBURY CLOCKS & WATCHES is 20 pages of useful information compiled by noted authority, Chris Bailey, detailing the history of the Waterbury Clock Company from its formation to its present-day successor, Timex. Along with a greatly expanded WATERBURY book, Tran has provided a much needed price update. The new book is a cornucopia of information not shown in his original Waterbury book. Tran shares with the clock community his unique skill in presenting this information in a form that is simple to use, and informative to both the novice and seasoned collector. As in the past, this book contains information garnered from many sources including original literature and advice from renowned horological experts. Tran's books have become the standard of the industry. A savvy buyer or seller of clocks using these books is more knowledgeable thanks to his untiring efforts in support of the hobby. With the advent of the Internet, as a means of buying and selling clocks, this type of information will become more in demand as the public tries to satisfy its appetite for a reliable source of reference. I would not place an eBay bid without consulting a thorough reference such as this. As a long time collector, I have made use of Tran's books to help in the identification and pricing of my clocks and am indebted to him for providing the necessary information to help make a sound decision when buying or selling. Make use of this fine new WATERBURY book and its additional information and along with other associated publications by the Arlington Book Company, you will soon discover these books are a must for your horological library. Here is yet another clocks volume from this tireless and keen horological publisher, Tran Duy Ly. The main body of this book consists of a new and revised, updated and extended version of a publication from the same publisher of about ten years back, which comprised illustrations from the original catalogues of the Waterbury Clock Company, and which now includes (dare we say?) all the known examples. The illustrations are sharp and clear, include the brief basic description with each, are sorted into sections of certain types of clock (such as Alarm Clocks, Figure Clocks, etc. ), and more over are indexed comprehensively. A separate inserted section contains a price guide to each example, intended to represent the price you would expect to have to pay for such a clock, not what you might expect to sell it for. This new edition includes a history of the Waterbury Clock Company by Chris Bailey and a very sensible section by Tran Duy Ly called "Important Tips" being advice on the important features of these clocks, especially in regard to assessing the condition, which is vital buying, selling and collecting them. I had not previously realised just what a vast number of models were made by Waterbury, nor had I appreciated that some of these clocks I have noticed at auctions were Waterbury examples. Some of the rarer models have prices which are interestingly high, some into the thousands of dollars - high enough to make us keep our eyes open in future. There is a short section on Blinking Eye Clocks by Gregory A. Zemenick, editing was by Larry B. Funk, indexing by Sonya L. Spittler, an Introduction by William Mittelstadt, and a touching facsimile is included of a letter from Bill Simmons, who was so impressed with Tran Duy Ly’s publishing efforts over the last twenty-five years (is it really be so long?) that he gave him his entire collection of rare original catalogues. The page size is eleven inches by nine, the book is in hardback glossy coated, contains just short of 600 pages, and is a massive source of information. If these clocks are within your area of interest, you’ve just got to buy it.